Boys love to play outside and sleep outside whenever possible. 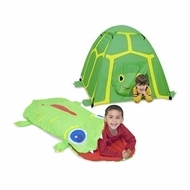 The Melissa & Doug Boys Outdoor Bundle – Tent and Sleeping Bag will give them the chance to sleep out in style. The set includes Augie Alligator, a 6-foot long sleeping bag that is filled with polyester to provide a comfortable night’s sleep. This bundle available at Today’s Concept is recommended for children ages five and older.